Detecting erosion and corrosion of pipelines is a major industrial problem. The cost of removing insulation predominates the cost for examination of the piping system. Using the radiographic technology, field service technicians can examine piping systems for corrosion defects while the piping system remains in service. Generally, the radiographic determination of wall thickness of piping systems is based on the visual evaluation of radiographs carried out by an inspector. This results to wall thickness values, which strongly depend on the human factor. The estimated values vary usually more than acceptable. A new technique based on the algorithm of Computed Tomography (CT) has been developed to overcome that problem. As known, the CT provides cross section images of the object reproducing the exact geometric shape. The new technique provides all benefits of the CT by avoiding the main disadvantages such as costs and examination time for hundreds of projections. The operation of this new technique called Computed Tomographic Pipe Wall Thickness (CTPWT) was simplified for application by technicians. It needs only a digital radiographic image for the wall thickness evaluation. After the pipe is radiographed, the corresponding image is digitised; an intensity profile is taken from the image in that direction, which is perpendicular to the pipe wall. The CTPWT algorithm demands only a few seconds of processing time to calculate the thickness of the pipe wall from a digital intensity profile. Measurements with the CTPWT method have shown, that the CTPWT method yields an accuracy better than 50 microns for a wall thickness less than 4 mm, and an accuracy better than 100 microns up to 7 mm wall thickness for a pipe diameter of 150 mm. An additional advantage of the CTPWT method is its independence of geometric unsharpness in a wide range. It allows the reduction of the source to object distance, because it operates reliably at high geometric unsharpness of up to 50 percent of the wall thickness. Therefore, the CTPWT is suitable for piping systems with limited accessibility due to complicated geometry. Furthermore, the reduction of the source to object distance yields a reduction of the exposure time and contributes to cost reduction of inspection. The CTPWT method provides accurate information about the condition of the piping system. This allows the user to increase the margin of plant safety by forecasting the wall strength and determining its remaining life. Figure 1 shows the classical set-up used to produce a radiograph of the pipe. The X or gamma ray source is located on one side of the pipe. The detector is located on the opposite side very close to the pipe. The central gamma beam penetrates the pipe and hits the detector surface on the right angle. The fan beam penetrates the edges of the pipe tangentially. The inspector should take care to determine the exact geometric enlargement factor of the actual inspection set-up. The source to object distance as well as the object to film distance is needed to calculate the geometric enlargement factor for the further evaluation. The tangential wall thickness determination requires a correctly exposed film. The region outside the pipe might not be saturated. The film should have an optical density up to four. The region of the mapped pipe wall might be not underexposed, and a minimum density of 0.5 is required. The recommended film densities are shown in Fig.2. The exposure parameters for phosphor plate systems can be derived from the conditions above. Phosphor plate systems have a non-linear response to the incoming X-ray intensity. This has been taken into account and a numerical data correction has been performed for compensation of the characteristic. In the single wall measurement technique, the gamma rays penetrate the pipe wall tangential to the outside and as well as the inside surface. The maximum material thickness that has to be penetrated by the radiation is located tangential to the inner pipe surface. This path length called as Lmax determines the source equipment that can be used for the accurate examination and vice-versa. Figure 3 shows the relations between the maximum penetrated material thickness Lmax and the pipe wall thickness in dependence from the outer pipe diameter. Each curve belongs to a pipe diameter listed on the right side of the diagram. The dashed lines describe the upper application limit of each typical commercial X and gamma source. The limits have been evaluated from various radiographs with standard lead screen filtering. In the following remarks, the influence of the scattered radiation is discussed. The radiation reaching the film is the superposition of the primary beam transmitted through the matter on a direct line from the source to the detector and the scattered radiation that reaches the film from any direction other than from the source direction. The direct radiation forms the shadow image of the object on the detector. In opposite to this the scattered radiation is non-image forming. Therefore, the ratio of the intensities of scattered radiation and of direct radiation IS/ID is an important indicator for the quality of the information seen on the radiograph. This ratio increases with the penetrated material thickness. If the material thickness reaches a value above the application limits as shown in Fig.3, the recorded X-ray image contains no information about the penetrated region. In that case, a collimated beam, the so-called narrow beam condition, is very useful to decrease the influence of scattered radiation and to extend the upper application limits. where I0 is the incident beam intensity, µ is the linear attenuation coefficient, ds is an element of length and where the integration is carried out along the X-ray. Simple expressed, the measured detector signal is formed by summation of the attenuation at each point of the matter along the ray. In the shadow radiography there is no relationship between measured intensity and depth-position of the indication. Nevertheless the Computed Tomography (CT) is able to determine the distribution of attenuation coefficients µ(x,y) within the examined layer of matter. Figure 4 shows the basic set-up for X-ray tomography. The collimator restricts the spread of the X-radiation to a single narrow beam. This beam is traversed continuously across the pipe. A detector records the transmitted radiation and the measurement is then stored as an intensity profile. After each crossing the X-ray source and the detector are rotated around the pipe by an angular element. The profiles of a completely scan can be processed in a computer to reconstruct an image of the examined slice of the specimen. 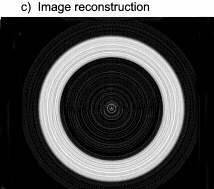 Many mathematical methods have been used for image reconstruction. Analytic methods are based on exact mathematical solutions to the image equations. One such method, Filtered Back-Projection (FBP), is used in most commercial CT systems. Since this method is very accurate and the side effects are negligible, it is implemented to the CTPWT method. In the next step of the reconstruction process, each filtered projection F is backprojected over the image plane. The resulting tomogram shows the contribution of the linear attenuation coefficient µ(x,y) within the examined cross section of the specimen. The distribution of the physical density r(x,y) can be obtained from the linear attenuation coefficient µ(x,y) by known physical relationships. The CTPWT method has been developed from the concept of CT. Additional conditions have been defined. One of them belongs to the geometry of the pipe. The ideal pipe is a rotational symmetric object. From this one could deduce, that all of the X-ray projections of the pipe are very similar. Based on this assumption a measured pipe projection might replace all others, which are demanded by the CT. Figure 5 shows the four steps how to determine the wall thickness of a pipe by the CTPWT method. After the pipe is exposed and the radiographic image is digitised (Fig. 6a), an intensity profile is taken from the image in that direction, which is perpendicular to the pipe wall (Fig. 6b). W1 and W2 are representing the wall thicknesses, which are looked for. On the next step a cross section image, a tomogram of the pipe is reconstructed by the Filtered Back-Projection method. The ring artefacts, which are seen in the tomogram of the pipe (Fig. 6c), are caused by the assumption explained above. Figure 6d shows the relative density distribution obtained from the tomogram. This curve enables the recognition of the pipe wall by numerical analysis. An algorithm like automated pattern recognition is developed to detect the pipe wall and to determine the thickness of the wall. Two steel pipes with variable wall thicknesses are evaluated to determine the accuracy and the reliability of the CTPWT method. The wall thickness of the pipes is varying from 1.3 mm to 10 mm by a diameter of 150 mm. At the wall thickness of 10 mm, the maximum penetrated material thickness Lmax amounts to 75 mm of steel, which demands at least an Iridium 192 gamma ray source as shown in figure 3. As detector we used an imaging plate system that has 12-bit digital readout. The imaging plates are scanned with a pixel size of 56 µm. A thin lead screen is used to eliminate the scattered radiation. The inherent unsharpness of the system 'Iridium-lead screen-imaging plate' is obtained experimentally about 0.25mm. The graph in figure 6 shows the mean deviation of the pipe wall thickness obtained by CTPWT in dependence of the nominal wall thickness. The vertical bars are representing the variation of subsequent evaluations on the same nominal pipe wall thickness but on different positions. The radiographic exposure parameters were film-focus-distance FFD= 400 mm, object-film-distance OFD= 75 mm, geometric unsharpness Ug= 0.7 mm and an exposure time t= 25 sec. The mean deviation varies between -30 µm and +80 µm in a range of 2 mm to 8 mm wall thickness. As known the recognition of an object detail on a radiographic image is dependent on the total effective unsharpness, which is predominated by the geometric unsharpness if the gamma source is positioned closer to the object. Consequently in practice a smallest allowed film-focus-distance is defined. Therefore the influence of geometric unsharpness to the CTPWT method is investigated in a range of Ug= 0.24 mm to Ug= 0.7 mm. Figure 7 shows the resulting curves that represents the mean deviation of the wall thickness obtained by CTPWT at different geometric unsharpness'. By means of these curves, one can determine how reproducible the measurement of the wall thickness is even if the geometric unsharpness varies strongly. Finally, the graph in figure 8 shows the mean values of all wall thicknesses that were determined by different positions and different unsharpness. For every mean value, 40 wall thickness values of 5 radiographs were used. The vertical bars represent the variation of 40 wall thickness values. Up to a pipe wall thickness of 5 mm, the CTPWT achieves a repetitive accuracy less than +/-50 µm. The differences in variation of the measured values which are seen in the diagrams are caused also by the actual state of the used imaging plate (scratches in the surface, bad contact between lead foil and imaging plate) and changes of gamma scattering conditions of the experimental set-up because the gamma source was moved closer to the pipe with increasing geometric unsharpness. Since these error sources still exist in the on field application, they were not suppressed in this work.